The July 4th celebrations continue onto the weekend aboard this all-white midnight fiesta on #TheLake. A night of drinks, great music, and unmatched views of Chicago’s skyline at its finest. What more could you ask for? Catch us living it up aboard The Spirit of Chicago for the best 4th of July weekend yacht party in ChiTown! Tickets will move fast, so secure your spot on this epic patriotic party cruise before it’s too late. The theme is all-white, so come in your best eggshell, ivory, and cream-colored attire. All-white not really your thing? Don’t worry, you can still party with us; we’re not really sticklers for dress codes. Enter the massive, quadruple-decker Spirit of Chicago Yacht for an unforgettable 4th of July weekend cruising on a #YachtyOnTheLake. We’ve got a live DJ keeping those party vibes with a mix of the latest and greatest hits, anthems, and bangers. Make your way to one of the yacht’s multiple bar areas and let our bartenders serve you up something nice. When you need a break from all the dancing and loud music, take a moment and head to sky-deck. Perfect for some amazing photo-opts; you’ll truly appreciate the incredible view you’ll get of Chicago’s skyline and various landmarks. Come on, get social with us! You should really share all those incredible memories you’ll capture with the rest of us on the internet. It’s only the right thing to do; but don’t just post em’, tag us in those pics and vids on Instagram, Facebook, and Twitter. Don’t forget to use #YachtyOnTheLake so everyone knows where the real party’s at! 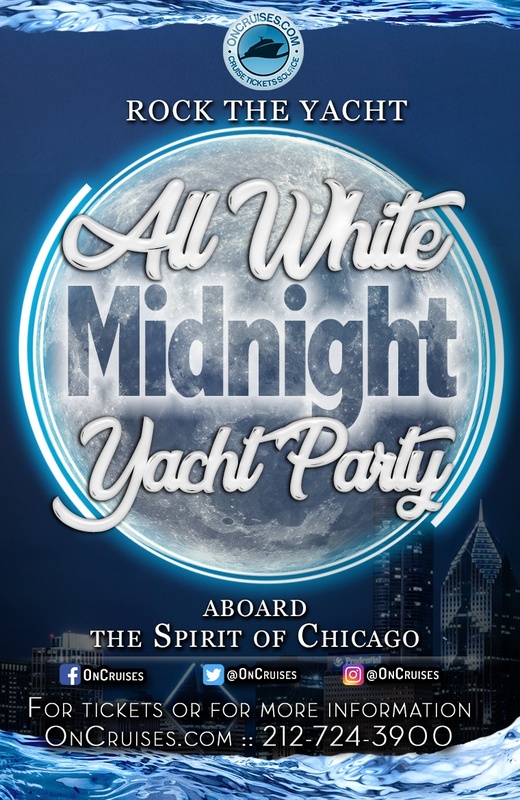 General Admission - Enjoy a sweet all-white yacht party with the party pros in ChiTown! Enjoy the stylings of our Live DJ all night long. Couple Package - Enjoy an awesome night with a special someone. Entourage of Four - Get the gang together and party hard on a lavish yacht. Dress code is optional! You will NOT BE TURNED AWAY at boarding if you are not wearing all-white. Okay, so now you’re all caught up on the festivities going on this 4th of July weekend. Now go tell some friends, sort out those plans, and order those tickets! Reserve your spot sooner than later, because tickets will be moving fast.